Four years ago, a mother who shall remain nameless, bought her children three tadpoles with the intent that, together, they’d watch the tadpoles metamorphose into frogs (small, aquatic ones) that would live a year or two at best. Together, they did watch as one tadpole died (and was subsequently dissected) and as the other two fulfilled their destiny as adult male frogs of the Pipidea genus. This mom and her kids enjoyed watching them shove frog food into their mouths and listening to them croak in the evenings. As with most pets, the children lost interest as soon as the dirty work of aquarium cleaning came around, and the frogs became a part of the background, not unlike the unpainted patch on the living room wall and the crabgrass along the driveway. Sound familiar? A recent post by fellow blogger and friend Keith Yancy recounted his daughter’s loss of Steve, a tadpole that never reached frog status. While it was hardly considerate to his daughter to do so, I cheered the demise of Steve, knowing years of drudgery (likely for the mom of that house) lay ahead. The cause of Steve’s death is unknown, and Steve, may he rest is amphibious peace, is buried in the yard. I maintain that the family dodged the amphibian bullet. Yes, watching the transmogrification of the two surviving MacLeod tadpoles was fascinating. Over a startlingly short time, legs and arms grow and the tail shrinks. The resulting young frogs were even kind of cute, albeit in way the young of many species are. They fit nicely in their Grow-a-Frog habitat while undergoing metamorphosis but quickly required a two gallon aquarium. With more room they just kept growing, finally reaching a rather appalling 5 inches from front claw to back claw. I changed their water regularly, treating it first so as not to poison the creatures, but the larger they became, the more difficult were the water changes. Frogs jump. That’s not surprising, but the height which these solely swimming creatures could get when in a net for transfer surprised me each time. I took to changing them at the sink, placing them in the bottom of a Rubbermaid pitcher with just a bit of water, so as to avoid escape. But during one transfer, I wasn’t fast enough moving my net from tank to pitcher, and one made a break for it, landing right on the flaps over the sink drain. After a few moments of open-mouthed staring, I did the practical thing. I called for my older son, then 10, and asked him if he would pick up the frog. He declined. Together, we watched the frog jump and land, this time dropping through the flaps into the garbage disposal. “Of course not!” I replied, not entirely certain what course of action I’d have taken without this impressionable witness. So I had no choice. I reached into the (unplugged) disposal and pulled the critter out, depositing him back in the pitcher with his more obedient buddy. The remainder of the tank cleaning was without incident, although I soon moved them to a newly vacant (due to gerbil deaths) 10 gallon aquarium with a filter to decrease hand-to-frog contact. And it worked. A few times a year, I’d scrape down the sides, sometimes moving the frogs to a bucket for a more thorough cleaning. I started feeding them a bit less often and found they thrived and that the aquarium remained much cleaner without all the uneaten food going to rot. I came to a resigned peace with the frogs, sure that they’d live only another year or so. Then I spoke to Bill. Bill’s a Biology professor, and Bill knows his creatures. A short description of our metamorphosis project prompted him to ask me if I knew how long these critters could live. No, I admitted. That’s when he dropped the frog bomb: 20 to 25 years. 20 to 25 years. The kids would be out of the house by then (hopefully), and I’d still be left with these stinky, messy frogs. Anything living that long should come with a long list of disclosures and options for surrender to Pipidea rescues should one move to a home prohibiting aquatic frogs, become allergic, or the like. How many parents are left with these frogs, caring for them years after their now metamorphosis-educated children have moved out and on? So I did what any practical mother would do. I tried to give them away. Homeschooling definitely hampers the transfer of pets to unsuspecting classrooms, so I took to social media, offering them on Facebook. No takers. This spring, after installing goldfish in the rain barrels to eat mosquito larvae (works if the fish live — don’t put them in before an unseasonably cold spring night), I considered adding the frogs to the barrels. Knowing they couldn’t weather the winter (they are native to Africa and South America), I opted out, not thrilled about the prospect of fishing them out in the fall. Resigned to my fate as frog owner for another few more decades, I gave their aquarium a much-needed scrubbing, down to the rocks, rinsed all well, and returned them to their home. The clean tank improved my attitude toward them, as it always does when they’re sporting spiffy digs. All seemed well, and two frogs were swimming, ribbiting, and eating as we left for vacation last week. The stench that met us at the front door, six days later, was difficult to identify. Alfie, our eight-year-old guinea pig was munching carrots, so the smell wasn’t from him. The garbage can, filled only with some of his not-very-noxious vegetarian-diet poops, also didn’t hold any clues. The kitchen revealed a soft but unblemished peach, and the garbage disposal had been run before we’d left. Befuddled, I left the kitchen, moving toward the back of the house. Ten feet from the frog’s aquarium, the source revealed its malodorous self. One frog was floating at the top, decay quite evidently in progress. The second frog was nowhere in sight. Suitcase still on the front porch, I whisked the aquarium outside and started dumping out the contents onto a gravel path. As the water sloshed out, I held my breath and turned my head. Out of the corner of my eye, I saw distinctive frog movement. I set down the aquarium and repeated my open-mouth staring as the frog hopped furiously away. With no net and no desire to touch anything that had just left that decay-ridden water, I ran into the house for a net and container of water, knowing my chance of finding the stinky survivor was slim but bound to try (a bit) of a rescue. Of course, I never found him. I returned to the definitely dead one and finished my clean-up work with only a shadow of remorse that I’d done a rather halfway job of searching for the missing Pipid. This entry was posted in homeschooling, pets and tagged aquatic frogs, Grow-a-frog, Keith Yancy, pipidea by mom4peaceuu. Bookmark the permalink. Ah, the danger of these little animals and educational experiences! Fortunately, I’ve failed to keep anything alive for very long, so we have a definite lack of small creatures around here, but my son is about to get his first pet rat – something I am NOT looking forward to. 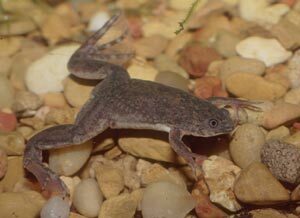 I’m curious if any of those tadpole kits come with native frogs so you could just release them into the wild? Sara, I’ve wondered the same thing, but all the tadpoles seem to be of this general type. These tadpoles are transparent — you really can see their internal organs. Perhaps this is the draw. I’d much prefer to watch the process then safely release!